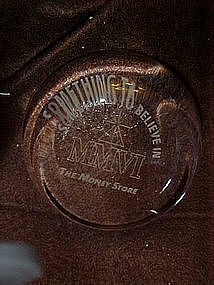 Nice crystal clear paperweight with reverse engraved logos on the bottom. It says, Something to believe in and has a pyramid (like on the back of a dollar bill) MMVI The Money store. Measures 3 1/2" in diameter, and is very thick. Pristine condition.